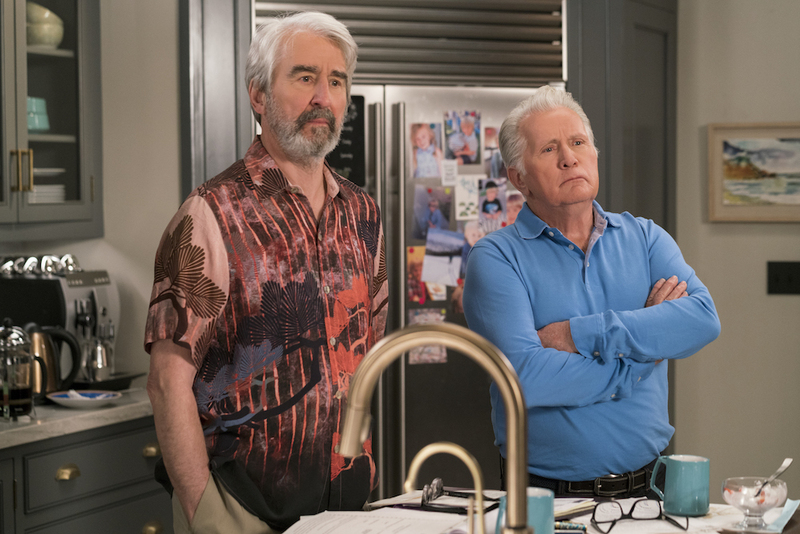 Allison B. Fanger chats about creating the look of Grace and Frankie and how the characters styles have evolved over four seasons. Allyson B. Fanger has been working on Netflix’s Grace and Frankie from the beginning. In our Emmys FYC chat, Fanger talks about the first conversations and early influences for the look of the character. She mentions Agnes Varda and her own mother-in-law as inspirations for crafting Jane Fonda’s Grace and Lily Tomlin’s Frankie. Fanger talks about some of her favorite looks this season including the much bohemian hippie look of Santa Fe worn by Frankie as season four begins. We also talk about how the characters style has changed over the years and how they’ve influenced each other. Read our chat below and consider Emmy nominations for Allison B. Fanger in the Best Contemporary Costume Design category in your voting. You’ve been working with Marta for four seasons now, but what did she say to you about the show when it first began? All I knew from her, before I read the script, it was a show about two older couples and the basic premise of two men having an affair and they tell their wives they’re leaving them. That was just enough for me to scream, “I love it.” It was always Jane and Lily and Marta and Hannah Canter found the story around them. It was interesting how that all came about. Here we are four years later. Before they even speak, we see everything. How has their clothing evolved over the four seasons? The character are so well drawn, with Frankie we had to dig deeper, we didn’t want her looking like “hippie lady”. I started to research female artists and unique personalities of certain ages. I didn’t want her looking like an old lady. Frankie is an artist, she’s a bit older. I looked to Agnes Varda and my mother-in-law who was quite artistic. My husband’s grandmother, her mother would bring all this jewelry from her travels for my mother-in-law when she was younger. There’s a lot of Grace in my own mother. I feel like when people watch the show, they find a piece of somebody they love in those two characters. They’re both so different. They have an influence that takes place over time on each other. I think we definitely brought more Frankie into Grace overtime. Grace’s colors were anywhere from white to black and in between. Grey, pewter, camel or navy. They were solids. Frankie was a Santa Fe sunset and that’s how we brought a little color into Grace’s world with the print shirts that I make. Grace has totally softened this season. Has she been wearing a lot of stripes this season or did I just make that up? I love the stripes. We have to ration our strips out because I love them so much. She does wear stripes and you are not imagining them. Then you have the addition of Lisa Kudrow this season. Did you dress her and what you wanted her look to say and how to throw her into the mix? Most shows, you have to send a photo of everything before you do anything, but this is so unique and amazing that they don’t. With this, they wanted to see photos so I knew this was important to them. In that opening scene, they wanted it to seem it was Frankie when we first saw her, so there was that part which was like a trick. Her character couldn’t be another Frankie because we already have that and she needed a different element to her. She has that different way to her in the way she talks. I thought it would be good to play up her figure because she’d been married to this older man. It was all about looking at the story and saying, “How can I best help this character be recognized as this person and how can I make it real as possible? I wanted her to have a sexiness and thought of those funny tracksuits. People still wear those. They do. People wear those and it’s really funny. Yes. You see them around. Let’s talk about the wardrobe for the Santa Fe Marketplace. That was fun. It was such a Santa Fe style. We leaned heavily on the bohemian style for that. The kaftan was amazing. There were all these other Frankie’s in the marketplace because that’s how it read. It read like a sea of Frankie’s. What became a big deal during the filming of that, their hair wasn’t working with the look. It just wasn’t working. It was a little tricky but in the end, it worked. It was such a fun episode to work on. Do you have go to brands when you’re not designing? I have my stores. I shop in the stores that I like to think that character would shop in. I have different stores for everybody. Frankie has her places. From the places that I went to in the first season, I still go to for her. I have two big fittings with them at the beginning of the season and have a big closet of looks that I can pull from depending on what’s going on in the episode. It’s never let me down. It’s the same with Grace, she wears the same yoga pants that she wore in season one. You know, I did that in London. I went to Camden Market and thought Frankie would love this place. She would love that place. I love that you said that. It’s amazing. Let’s talk about the men and how they’ve evolved this year. Robert has gotten more and more casual as time has gone on. I have a lot of pieces for him with his suits and his pocket squares and vests and I loved that about him, but I can’t justify that about him now that he’s not working. He’s just doing a lot of theater performances. He has evolved in that way. When he busts out a suit, he pulls out all the stops because he’s just very well dressed. He cares and is put together. I love that he has the older man vibe. Culture has gotten so casual, especially in LA, so I love that he always dresses. Saul, in the beginning, for a few seasons was very textural and you could see the texture in it. It was all earthy tones. I’d buy him camping shirts because I thought he was a camper. I’d get him those shirts from Columbia. We noticed that some had weird prints on them and I think that’s how we morphed into those print shirts we use on him.I brought in old flannels for Saul because I thought he would have had those in his closet for a long time. I like to think they’ve had them for a long time. Think of the yoga pants, people have the same damned yoga pants they had years ago. That’s what we do, we wear the same pants for years. What looks have you loved this season? I loved the whole Santa Fe look on Frankie. I loved what she wore back from the airport when she had that great woven Santa Fe vibe to it because I wanted her to feel more Santa Fe when she came back. I loved the episode where she goes to the Post Office and she has all the different outfits pretending when she was in disguise. I loved that red kaftan and that episode because she has a lot of different looks in it.